1. Place quinoa and vegetable broth/stock into a medium sized saucepan and bring to a boil. 2. Once boiling, reduce heat, cover, and simmer until all liquid has absorbed, about 20 minutes. Stir occasionally. 3. Meanwhile, in a large skillet, heat the butter over medium heat until melted. Add in garlic and cook until fragrant and barely browned. 4. Add in diced ham and chopped vegetables. Season with salt and pepper. Cook until vegetables are tender but still slightly crisp. 5. Once quinoa has completely cooked, stir in cream cheese and fresh chopped basil until combined. 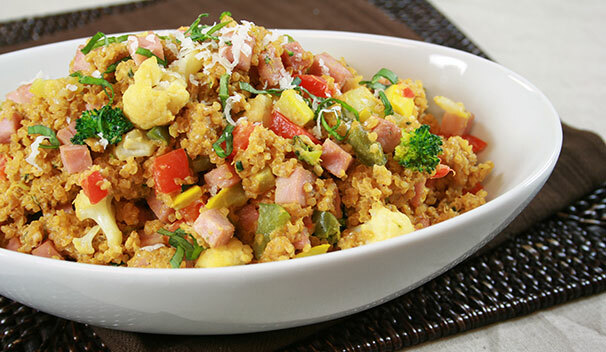 Add the cooked ham and vegetables to the quinoa and mix well. 6. Top with grated Parmesan cheese before serving.